Stage 2 (DINANTRONICS Performance Tuner in conjuction with Dinan intake and exhaust) Maximum Power: 530 HP, 504 lb-ft of torque. The DINANTRONICS™ Performance Tuner is a highly engineered and sophisticated piece of computer hardware and software that enhances engine performance, without negating or voiding your new car warranty coverage and without affecting long term reliability or the functionality of on-board diagnostic systems. It is also the only tuning device emissions legal in all 50 states. The ultimate objective of developing this piece of technology was to provide the ability to control every signal entering and exiting the BMW factory Engine Control Unit. These items are unique to Dinan and together they embody the apex of performance engineering in a powerful, reliable, and warrantied package. The Dinan Difference is possible by employing a full staff of talented engineers that are well rounded in all aspects of their job. Manipulating these signals with an adept hand all the while keeping an engine running at its best and with the most reliable power is what Dinan is all about. 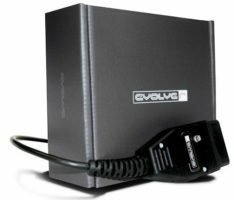 Plug-in tuning devices all have one thing in common, they send a modified signal to the factory ECU, telling it the boost pressure is below target values. This then causes the factory ECU to raise the boost pressure to what it thinks is the correct value. This modified boost pressure signal causes errors in fuel mixture and ignition timing. These errors can cause the on-board diagnostics systems to set faults, but they can also cause exceedingly high catalyst temperatures and a loss of power. In addition, when power is increased, exhaust gas temperature will increase as well and this must be countered with a slightly richer air/fuel mixture. 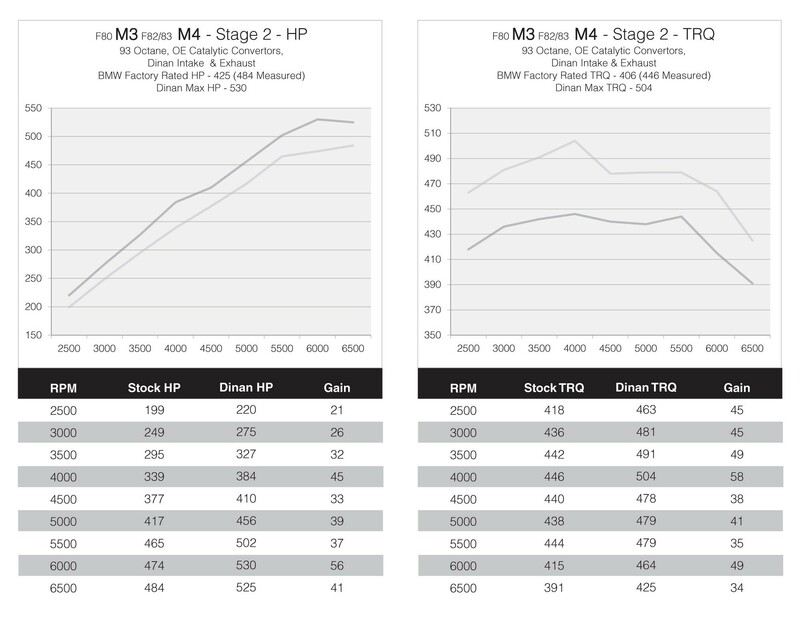 The DINANTRONICS Performance Tuner uniquely has the capability to adjust target Lambda, correct short term trim as well as ignition timing errors induced by raising boost pressure. This enables Dinan calibration engineers to optimize air/fuel mixture and ignition timing at elevated boost pressure throughout the entire gamut of engine RPM and engine load. 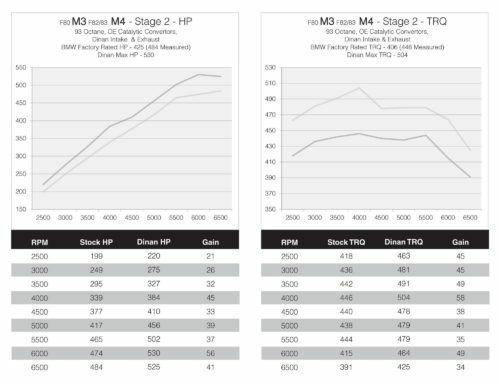 Additionally, the ability to correct short term trim corrections (the difference between target and scheduled fuel mixture) remain within OEM specifications. This minimizes knock sensor activity, which in turn means smooth engine performance, catalyst protection and power increase, while this is also required to make the car emissions legal. Dinan engineers have worked for two years on the DINANTRONICS Performance Tuner in efforts to provide BMW enthusiasts with Performance without Sacrifice. The DINANTRONICS Performance Tuner is engineered using the best possible components and advanced hardware. The most obvious and visible component is the elaborate wiring harness. Using OE connectors and an expandable braided wiring sleeves ensures that all visible components appear as if they come straight from the factory. More importantly however it guarantees long lasting and dependable performance due to the use of high heat, moisture and abrasion resistant materials and design. 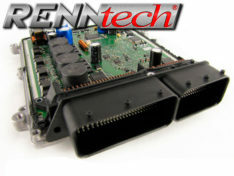 The other hardware element involved is the Dinan electronic control unit (ECU) itself. While its outward appearance may seem tame, the processing power and sophistication held within its internal circuitry is anything but. Capable of delivering signals to various systems at an astonishing 4000 times per second the DINANTRONICS Performance Tuner yields the power to control all current signals delivered to the ECU as well as those developed in the future without a hiccup in performance or reliability. This immense processing power equates to a high degree of engine control resulting in a much lower likelihood of setting a fault. In addition smoother running conditions and superior drivability are achieved, all of which are Dinan hallmarks. Dinan’s comprehensive warranty program, introduced in 1997, provides superior warranty coverage to that which you would find elsewhere. If your vehicle is currently covered by the vehicle manufacturer’s new car limited warranty, Dinan® products are warranted for the remaining term of the vehicle manufacturer’s new car limited warranty. The manufacturer’s new car warranty is limited to 4 years or 50,000 miles (80,000 kilometers in Canada), commencing on the date of first retail sale or the date the vehicle is first placed in-service as a demonstrator or company vehicle, whichever is earlier. Dinan’s warranties are transferable when ownership of the vehicle into which the Dinan products were originally installed is sold. BMW automobiles can now be performance-tuned without the associated concern of negatively affecting the new car warranty coverage. The DINANTRONICS™ Performance Tuner was designed and built to be the only tuning box on the market that is emissions legal in all 50 states by virtue of California Air Resources Board executive order D-176-42. There is more to a tune than just cranking up the boost. Power needs to come on smoothly and in a predictable way to make the car as fun to drive at wide open throttle as cruising around town. It is your BMW, but reborn with new found acceleration and speed. Plug-and-Play installation in two hours or less, available through our network of 200+ Dinan Dealers. 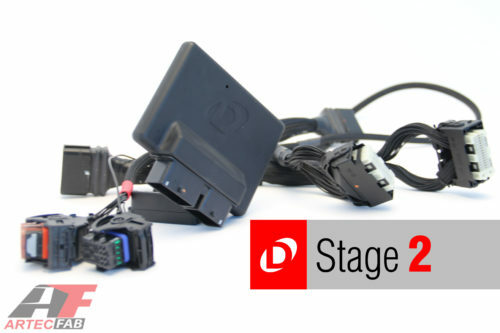 Dinan’s ECU is Bluetooth® Smart meaning that you can change maps simply via a Bluetooth connection on your iPhone or Android device. Just install and you are done! The DINANTRONICS Performance Tuner was engineered with future expansion of functionality in mind. Boasting the most powerful processing power on the market the DINANTRONICS Performance Tuner can handle more functions and processes than any of its contemporaries. To that end the Dinan performance tuner is capable of interfacing with the CAN and FlexRay communication systems which allow for controlling powertrain functions, among others. This means that when new functions are developed there will be no need for a new box, just a short software update at your local Dinan dealer. Also keep in mind that if you are upgrading stages that the only cost incurred to you is the price difference between the two stages (and any supporting hardware mods). Dinan guarantees you will be impressed by the DINANTRONICS Performance Tuner and the performance it provides that we offer a 3-Day return policy. If you aren’t satisfied with what the Dinan solution brings to the table within 3 days of install you can go back to your dealer for a full refund (installation labor costs still apply).